Monday 28th of January sees a talk at the BFI Reuben library about film posters and whether they inspire watching films. There will be a slideshow to explore examples of fantastic film posters, from classics to obscurities, presented by BFI Curatorial Archivist Nigel Arthur and Ewa Reeves, who are co-authors of the book 77 Posters/ 77 Plakatow. How about some spectacular hand painted film posters? Currently on display at SOAS’ (University of London) Brunei Gallery is an extraordinary exhibition of Ghanaian film posters. These were hand painted onto sacks or canvas by highly skilled artists to advertise new releases to film goers, before the digital age took over. African Gaze: Hollywood; Bollywood and Nollywood film posters from Ghana is on at the Brunei Gallery until 23rd of March. London Met staff and students have access to BFI screenonline, an online encyclopedia devoted to British film and television. Here you can find information about such things as graphic style in promoting films, and much more about the history of tv and film in Britain. Audio and video material can only be viewed within the University. 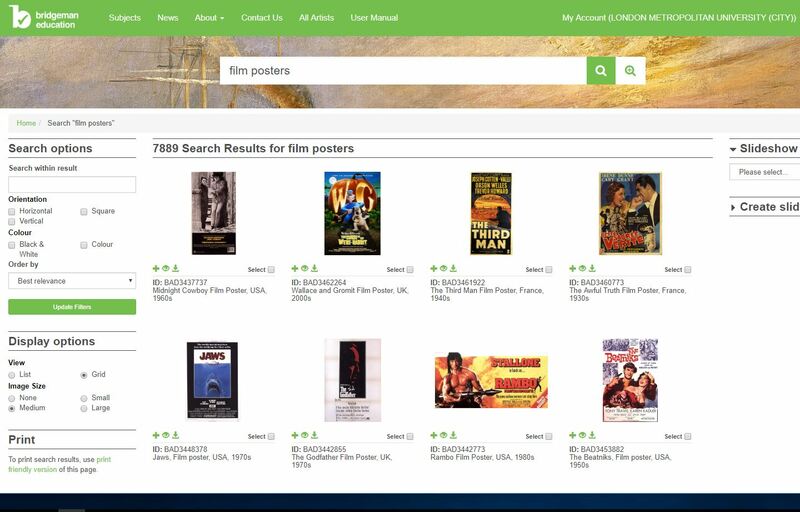 Bridgeman Education, an online image database (available via the library catalogue with your London Met login), has over a million images available to search and download, including thousands of film posters. Remember to check the copyright status of the images before use (the library license allows educational use for staff and students). And if you still need more, there is also VADS, (Visual Arts Data Service) a visual arts database which has a collection of over 100,000 images, including many film posters. This entry was posted in Databases, Digital online archive, events, Exhibitions, External archives and libraries, Library e-resources, Uncategorized and tagged "graphic design", "moving images", advertising, events, exhibitions, film. Bookmark the permalink.